Press garlic and let sit for at least 5 minutes to bring out its hidden health benefits. 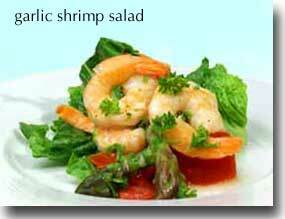 Make sure shrimp is completely thawed and patted dry with a paper towel, or it will dilute the flavor of the salad. Add broth to medium skillet and after it has heated up, Healthy Sauté asparagus for 5 minutes. Whisk together lemon, oil, mustard, honey, garlic, salt and pepper. Toss shrimp, asparagus, parsley, and tomato with dressing and herbs. Allow shrimp salad to marinate for at least 15 minutes.